"At Last! ... A Wedding Ring for Guys Who Can't Wear Wedding Rings"
Let's face it, your hands go places that your gold, platinum, titanium, or tungsten wedding band can't. A) Risk the discomfort and danger of losing your finger to "de-gloving"
B) Leave your symbol of commitment at home .. or ..
C) Buy a Bondwell active wedding band to wear anywhere! Don't Risk Losing Your PRICELESS Ring .. or Finger! Show your commitment everywhere with this safe, durable, high-quality silicone wedding band. In the US alone, 2,400 divorces happen EACH & EVERY DAY?! Bondwell was founded to build stronger marriages by offering the strongest active wedding rings in the world. For every ring sold we donate 10% to our non-profit partners, which covers the cost of marriage counseling for couples in need. With your help, we can save thousands of marriages worldwide. So what are you waiting for?! Click the "Add to Cart" button and save a marriage today! You'll love it. Your wife will love it. And you'll help save a marriage in the process. HIGH-END "GO ANYWHERE" WEDDING RINGS- Our heavy-duty Bondwell Silicone Wedding Rings are a responsive, lightweight alternative to your metal wedding band. These long-lasting, medical grade silicone bands are designed to a specifically engineered tensile strength that will flex or break without "deglove-ing" your finger. They keep finger safe & comfortable under any condition, but are tough enough for the everyday workout warrior. GREAT FOR THE ACTIVE, "WORKING MAN" - Ideal for active men and guys who work with their hands. Our silicone wedding bands are often used for sports and fitness, during a workout at the gym, or any trade that involves working with your hands. Police officers, firefighters, mechanics, construction workers, and electricians love how our wedding bands keep them safe on the job. Makes the perfect gift for any active man! SUPERIOR DESIGN & QUALITY - All of our men's silicone wedding rings are made of hypoallergenic, medical grade silicone to keep your finger safe from skin irritation. The non-porous "Hydrobead" waterproof technology repels water & won't swell or shrink when wet. Hands down the top-of-the-line silicone wedding ring. 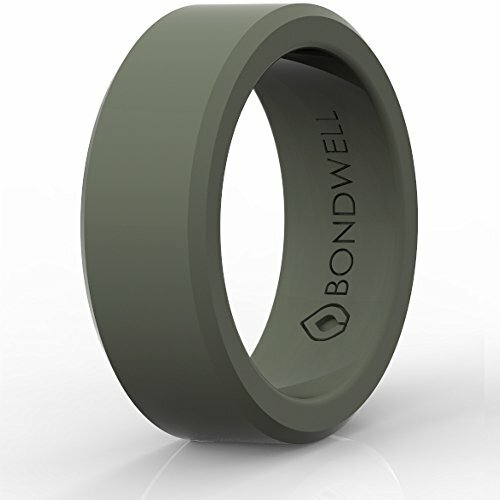 MADE FOR A MISSION - Bondwell Silicone Wedding Rings were founded to build stronger marriages by offering the strongest active wedding rings in the world. For every Bondwell ring sold, a donation is made to help save or grow a marriage. 100% MONEY-BACK GUARANTEE - We stand by the quality of our silicone wedding bands, and if they don't work out for you for any reason then send it back to us for your full money back. We know you will love them! To enjoy your premium wedding bands risk-free, click 'ADD TO CART' now! If you have any questions about this product by Bondwell, contact us by completing and submitting the form below. If you are looking for a specif part number, please include it with your message.